Real Estate Cost Segregation generates significant cash flow by accelerating depreciation. The process carves out shorter-lived assets (that qualify for 5-, 7- or 15-year write-off periods) embedded in a building’s construction or acquisition costs (generally depreciated over 39 years). Post-1986 real estate construction, building acquisition or improvements, where no cost segregation study was performed (even though the statute of limitations previously closed on the property construction/acquisition year). Our extensive experience conducting Cost Segregation studies covers many industries, including, commercial rental property, corporate office buildings, distribution centers, automotive dealerships, bank branches, food processing plants, hotels/motels, manufacturing facilities, multi-family residential properties, restaurant facilities, shopping malls and student housing locations. 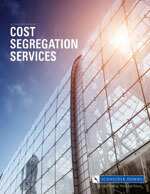 For more information on Schneider Downs' Real Estate Cost Segregation Services in Pittsburgh, PA or Columbus, OH, contact us for our brochure or complete the Cost Segregation Benefit Analysis form.